Yes, the headphones in the photo are real. You can buy them. Get out your tiny violins, because it's time to feel sorry for us. The problem with a headphone show like CanJam New York City is the same problem faced by someone who has to judge a wine competition: unless you take very small sips, you are simply not going to be able to continue. And because of the sheer number of headphones, amps, and DACs the populated the conference floor's main room in the Marriott Marquis Times Square, we had to ration the amount of time we spent with each. It was either that, or risk missing some entirely. However, we managed to get impressions from just about all the big releases at the show. Check out our photos below, and remember to read our coverage of the first day, too! iFi Audio had a big showing at the event. There are two of their new models that we want to highlight here, the first of which is the pocket-sized xDSD. Unlike the coffin shape of most iFi gizmos, this has more of a hip flask vibe, with a terrific volume wheel. It's an amp and DAC that can handle just about anything you throw at it, and very obviously, takes DSD audio. It's very cool - and doesn't cost the earth, either. You can read our review of its predecessor, the nano iOne, here. Of course, the little xDSD paled in comparison to the big dog: the monstrous and brand new Pro iDSD, a $2,500 silver box that can do just about everything. Switch between solid-state and tube audio? You got it. Handle DSD up to 1024, with upsampling? No sweat. Look really, really good while being really, really powerful? Come on. Give it something hard. While it's true that this is unlikely to be for everybody, it blew us away with its tight, controlled, impactful sound. Expect a full review in the future. Present at the show was speaker maestro Paul Barton, of PSB and NAD fame. He gave us a tour of the new PSB M4U 8 headphones. Let's see… Wireless, noise-canceling, a price of $399, and something called Roomfeel. This is an intriguing signal processing that mimics the sound of loudspeakers in a really well-treated room – only with headphones. Paul gave a talk on this earlier in the event, and although some of it was a little hard to follow, there was some serious science behind it. The headphones themselves were breathtaking, with a sense of realism that we wouldn't have thought possible in this price range. Roomfeel is the real deal. Again, expect a review soon. We took a little break at this point to listen to some Schiit. While they weren't showcasing anything new, how often do you have a chance to try every single one of their products in one place? We had a lot of fun at this table. you can read our review of the incredible $99 Magni 3 amp here. Final Audio. 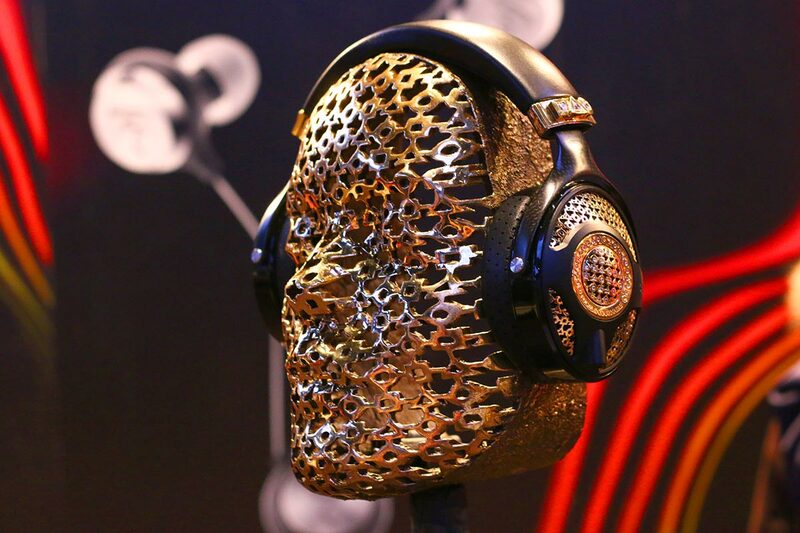 Japanese makers of exceptionally sweet headphones, ranging from $54 in-ears to $3,000 planars. They are also one of the few companies who are genuinely pushing headphones forward, as evidenced with their DIY in-ear project. This extremely limited edition concept has you not only buying a pair, but then subsequently receiving a tutorial from Final about how to customize the sound to your heart's content. With nothing more than a pair of tweezers and little advice, you can get the sound you want. We didn't get to play with that at the show, but we did get to try out many of their headphones, including the absolutely astounding E2000s. $45 for some of the best in ear sound we've ever heard? Why the hell not? The headphones in front are the old Sennheiser HD800s, a beloved pair of open-back phones. The ones in the back, in focus, are the brand-new HD820s. They are the result of an experiment by Sennheiser maestro Axel Grell to make a pair of closed-back headphones, without the disadvantages of closed-back headphones. That means an outer housing of gorilla glass which reflects resonances back into specially designed acoustic chambers, meaning you get unbelievably clear sound. These weren't the final version of the $3,500 headphones, but they were a working prototype, and we got to have a good listen. We can't wait to do a full review on them. Often, the most interesting stories at an audio show aren't at the most packed booths. They happen when you go a little bit off the beaten path, and visit the tables that nobody else seems to be paying attention to. Although we'll admit, we only made a diversion to check out the In-Earz Audio booth because we couldn't quite work out what was going on there, and got curious. What we found was…kind of amazing. Parked behind the display was a man named Stephen Ambrose. He literally invented in-ear headphones. Virtually every single table in the hall was showing a product derived from something this man did in the 1960s, and hardly anybody was paying attention to him. That's not even the weird part. The weird part is that his invention caused a dramatic upsurge in hearing loss, something which really frustrated him, and he set out to find out why. Bear with us, because this gets really good. Ambrose discovered that in-ear headphones create a ton of pressure on the eardrum, pushing it way beyond its limits. He set out to relieve this pressure, and has created some of the most fascinating gizmos we've ever tried. One of them uses a second diaphragm inside to take the pressure from the sound – you get all the audio, without any of the air pressure. The one in the photo above was extraordinary. It's a bubble, that you stick into your ears and inflate with a syringe (and by the way, nothing is more unnerving than an audio engineer with a syringe). The audio quality is extraordinary, and the bubble absorbs all the air pressure, meaning you can listen without worrying that you'll damage your eardrums. These are both prototypes for the moment, and we have absolutely no idea how the final product will look, but damn. That was cool. It was great to see FiiO at the show. We just wrapped a review of their amazing Q5 headphone amp, and the company's Peter Fan was eager to show us the rest of the lineup. We demoed the upcoming M7 player, a tiny, lightweight little gadget with a full-color touchscreen. It was simple and effective and we can't wait to bring you the full review, which, all being well, should be up sometime in April. Meet the Mytek Brooklyn DAC+ - the new version of the excellent Brooklyn DAC. Same great display, same powerful sound, and probably the best logo in the audio world. We had a lot of fun listening to this one, even if almost all the improvements are entirely internal. This is the Mr Speakers VOCE. Mr Speakers is Dan Clark, and his headphones are everywhere. We doubt there was a single table at the show that didn't have an Aeon Flow at them. These were his first electrostatics, which he says he did because he wanted the challenge, the absolutely rock. They come with filters that you can insert yourself, although we prefer them naked, and unlike many electrostatics, they have no problem handling tracks with tons of low frequency content. We don't really deal with electrostatic cans on this site, but these headphones were too cool to pass up. See that amp behind the VOCE? That's the HeadAmp Blu Hawaii, an absolutely enormous electrostatic amp with four massive tubes. It's a bit too much for the site, but that's okay, because they make normal amps as well – like the Gilmore Lite mk2 above. It's a fun amp with an exciting sound that we really got a kick out of, and it's a reasonable price too ($499). "Hi. We're Focal. We are French. We also make the best headphones on earth, the Utopia. They were reviewed on the best audio website on earth, The Master Switch, and they said so. But we weren't satisfied. We hadn't taken things far enough. So despite the fact that the headphones already cost around $3,000, we decided that we had to improve them. How? How, you ask? BY COVERING THEM WITH DIAMONDS AND GOLD. "We are friends with people from the jewellers Tournaire, and they were totally down with this. Everyone will want to buy these. It's practically an impulse buy. I mean, who doesn't have $125,000 in their back pocket?" Yes, these were a real thing that we saw the show. No, we did not put them on. We were worried about dropping them. And that's it! What an incredible show. Big thanks to Jude from Head-Fi and the CanJam team for hosting us, and to all the headphone makers who put up with our stupid questions. You guys are the real MVPs. Our show report for the amazing CanJam 2018 - the biggest headphone meetup of the them all, live from Times Square in New York City. We admit: we may have gotten a little carried away. But can you blame us? If you deposit any writer from this website into a hall filled with high-end speakers, amps and headphones, we're going to run around like the kids in a chocolate factory. We saw EVERYTHING. Concrete speakers. Eight-foot-tall driver stacks. Turntables that look like something from the lair of a Bond villain. A torrent of wonderful noise, issuing forth from the rooms of the Toronto Convention Centre. It can often be a challenge to go for an audio company that prizes rigorous engineering over marketing flair. Judging by their website and their staid, sober presence on social media, you might be forgiven for bypassing iFi Audio. Don't.